The federal agencies charged with producing an environmental impact statement and overall strategy on how to manage dams on the Columbia and Snake rivers, while also protecting salmon and steelhead, will complete the process a year earlier than expected. According to the U.S. Army Corps of Engineers it will now complete the Columbia River Systems Operation Review in September of 2020 to comply with an executive order from President Donald Trump. The U.S. Bureau of Reclamation and the Bonneville Power Administration are assisting. The review and EIS were ordered by U.S. District Court Judge Michael Simon of Portland in a 2016 ruling that struck down the federal government’s latest attempt to balance dam operations with efforts to save and recover endangered and threatened salmon and steelhead. In October, Trump issued an executive order to expedite permitting and other required documentation of water infrastructure projects in the Western United States, with an aim toward minimizing regulations and maximizing efficiencies. Included in that order was a demand to complete the court-ordered EIS 2020. 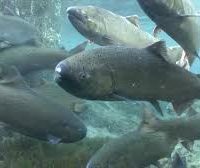 The study will include an alternative that looks at breaching one or more of the four lower Snake River dams.